Freemake Audio Converter is a nicely designed, easy-to-use audio converter with which you can convert music files in the most popular formats: MP3, WMA, FLAC, M4A and Ogg. 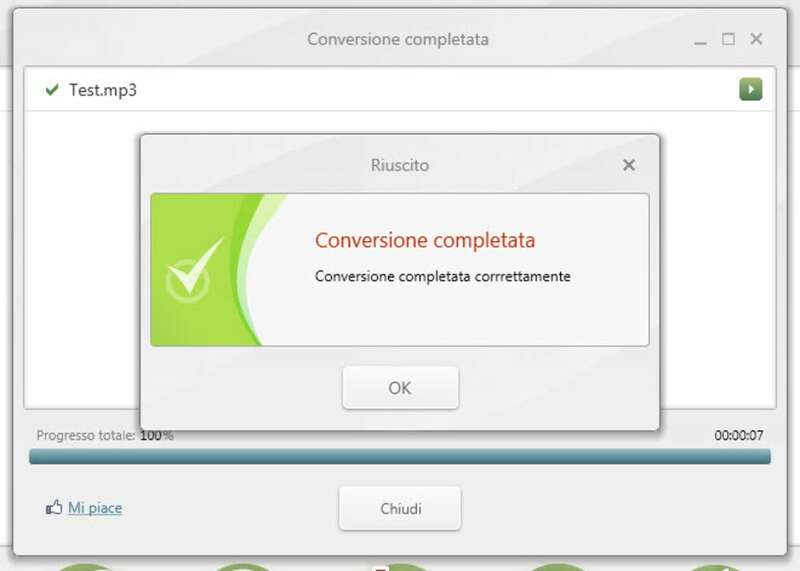 Using Freemake Audio Converter is really simple. First, click the Audio button or just drag and drop some files onto the interface to get started. You can convert multiple files at the same time, and even add video files so that the program extracts the audio track from them. 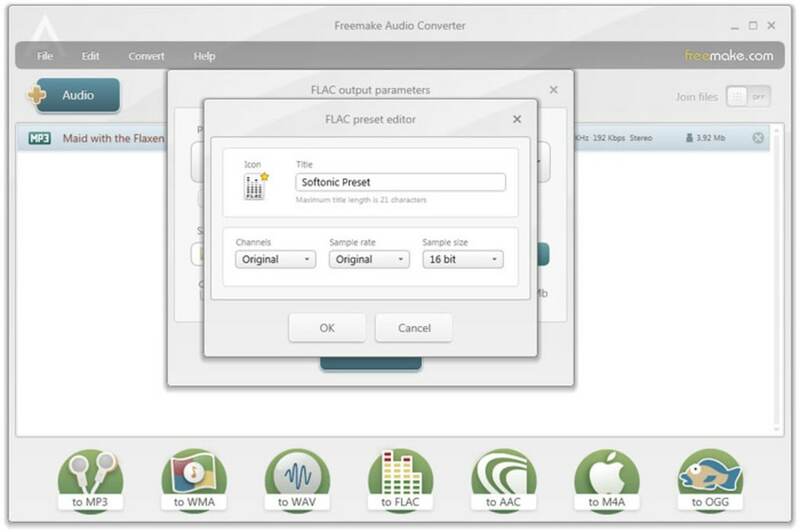 Then, select the target format by clicking the buttons at the bottom of the interface in Freemake Audio Converter. 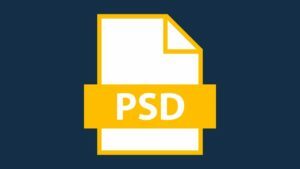 Each format has a few default presets, and also lets you create custom ones. Finally click the Convert button and you’re done. 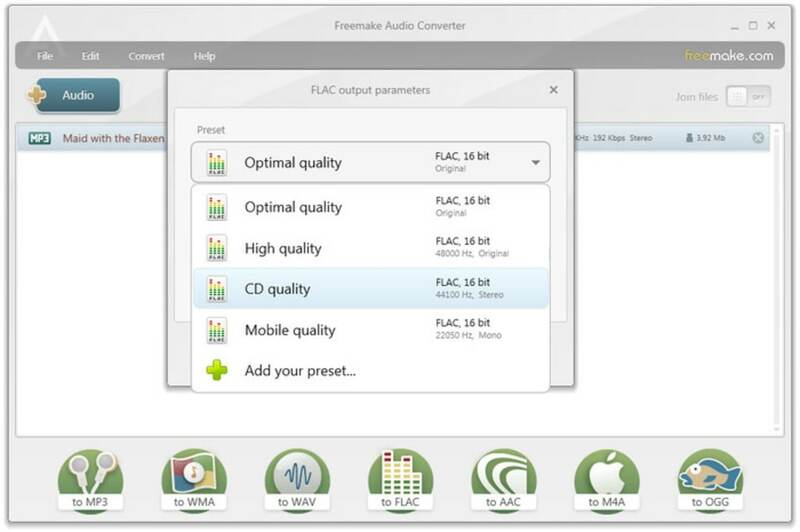 Freemake Audio Converter has some nice extra features, like the ability to send MP3 and AAC files directly to iTunes or an option to merge multiple audio files into one. On the downside, the program doesn’t have a built-in player, which could be quite handy. With Freemake Audio Converter you can easily convert audio files and extract sound from video files, in the most popular media formats. 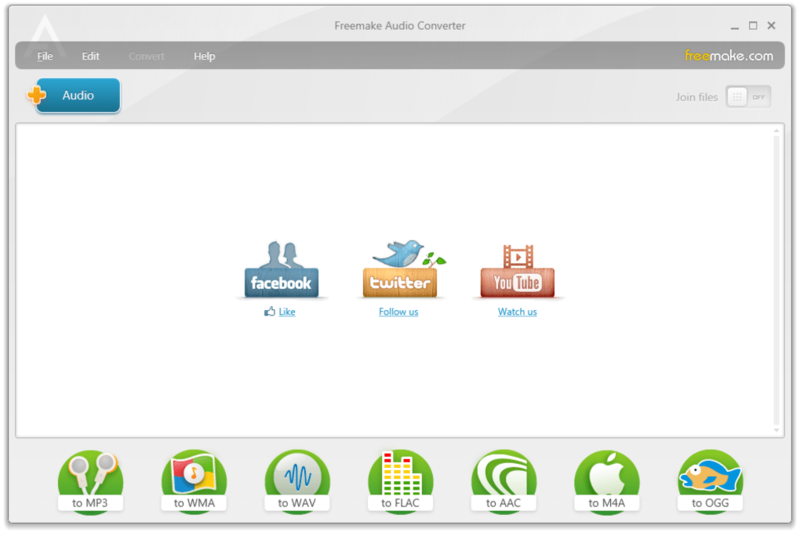 Free Audio Converter from Freemake is a fast and handy tool for audio content management. It supports most existent audio formats and lets convert them to MP3, WMA, WAV, FLAC, AAC, M4A, OGG. 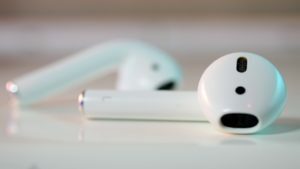 This is an easy MP3 Converter to iPod, iPhone, iPad, Zune, Coby, Sansa, iRiver, Walkman, Archos, GoGear, etc. Sends MP3 and M4A files directly to iTunes. 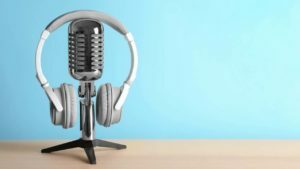 Extracts audio from video (over 200 video formats supported) in two clicks and enables audio files joining. 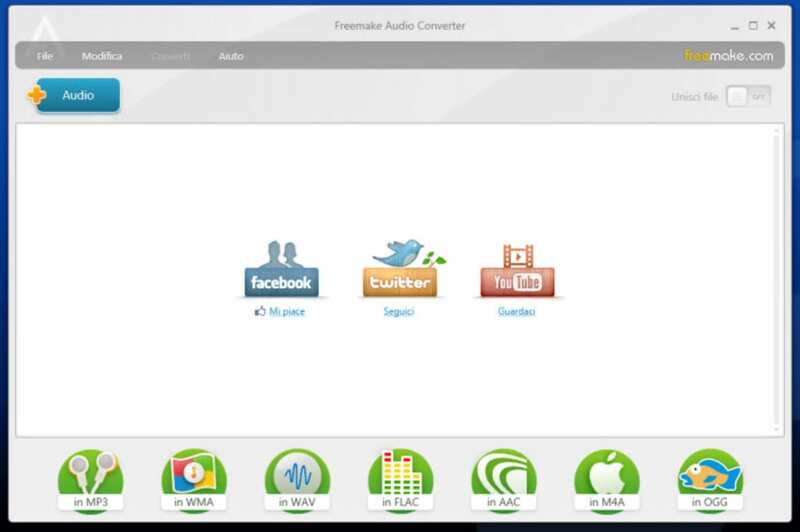 Freemake Audio Converter is optimized for netbooks and runs under Windows XP/Vista/7. 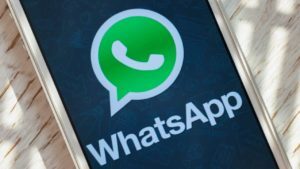 It does not have any hidden costs or intrusive advertising. 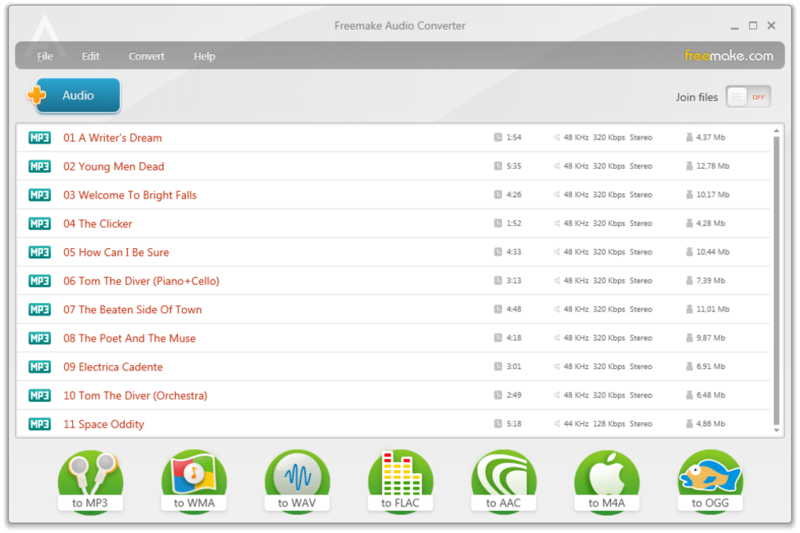 What do you think about Freemake Audio Converter? Do you recommend it? Why?